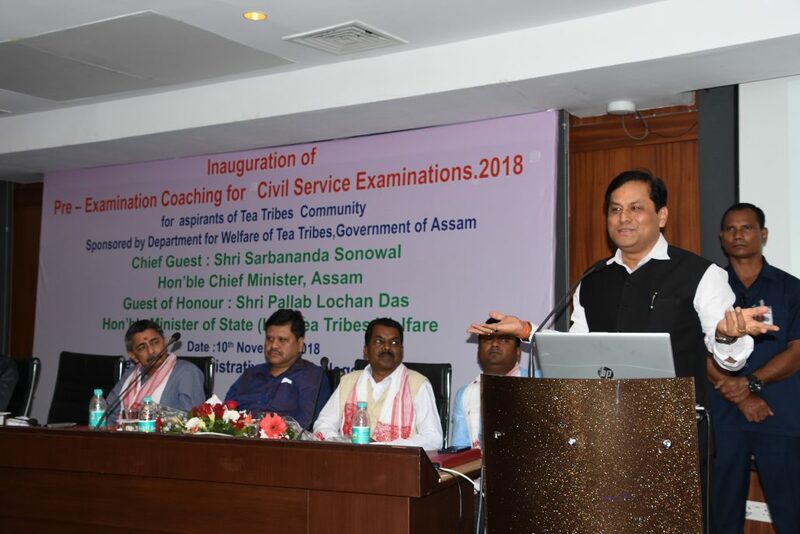 Assam Chief Minister Sarbananda Sonowal speaking at the inaugural ceremony of a Pre-Examination Coaching for Civil Service Examination 2018 for aspirants of tea tribe community at Assam Administrative Staff College on November 10, 2018. Assam Chief Minister Sarbananda Sonowal said that because of the proactive and pro-people initiatives of the State Government, the black clouds hovering around tea tribe communities in the form of various problems have been dispelled. Inaugurating a pre-examination coaching for civil service examination 2018 for aspirants of tea tribe community at Assam Administrative Staff College here on evening, Chief Minister Sonowal said that ever since the new Government assumed the reign of administration in Dispur, several pro-people initiatives for the people belonging to tea communities have been initiated, which resulted in wiping out several problems faced by them. He also said that people of the tea tribe community contributed immensely to the growth of the economy of the State. Because of their dedication, Assam tea has etched its name in the global market. Sonowal, moreover, said that though people belonging to tea tribe communities have been facing problems since decades, the previous State Governments seemed to have turned a blind eye to their problems. On the other hand, the present State Government realizing the inherent problems of the tea communities made its commitment loud and clear took several ambitious schemes for their overall development. He also said that imparting pre-examination coaching for civil service examination for aspirants of tea tribe community is one of the many programmes that State Government has undertaken for the socio-economic and educational development for the people of the communities who have been working relentlessly for the economic development of the State. The Assam CM urged the 50 students who have been shortlisted for the pre-examination coaching to work hard and become successful in their endeavour and be a source of motivation for other students to emulate them. He also advised them to inculcate the feeling in them that they are the best and work accordingly to bring laurels to the State. He also urged them to take the responsibility and create sparkles for a glittering State. Chief Minister Sonowal also said that there is no difference between him and others members of tea tribe community as he eloquently made it clear that the Chief Minister Office is always there to help the members belonging to the backward community. Sonowal also handed out folders to the aspirants of the tea tribe communities who are taking part in the six month long coaching which has been sponsored by the Department for Welfare of Tea Tribes, Government of Assam. Minister of State (Independent Charge) for Tea Tribes Welfare Pallab Lochan Das, Additional Chief Secretary Jishnu Baruah, social worker Prahlad Gowala also spoke on the occasion.